Back as the spring was warming up, one of my daughters commissioned her dad to hang a rope from our deck to a great big tree. Soon after, the ages old practice of hanging her clothes on the line, began. 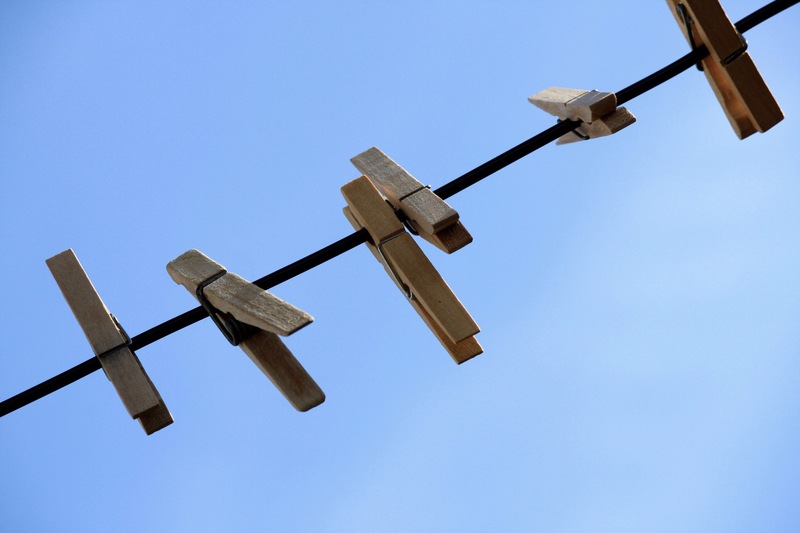 After seeing her take clothes off the line with a folded crease, down the middle, from where she had hung them, I purchased clothes pins for her use. Once school and work were done, and summer break began, I joined her in her environmental exercise of hanging clothes on the line. My participation was more selfish … I did not want to use a heat-producing appliance in the summer heat. As my habit began to form, I grew to love hanging out clothes out on the rope, even with the dollar store pins that snapped apart frequently. Though the clothes came in less soft, and with more wrinkles, they also smelled heavenly fresh, and my whites sparkled after experiencing the natural bleaching power of the sun. I did have inner turmoil about … unmentionables. Would I hang them, for all the world to see (or the families who came to our pool for swim lessons with my daughter)? My uncertainty faded and soon I was letting it all hang out. One day, while reaching up to pin a piece of clothing to our rope, I thought about how joyful I was to hang my dirty laundry, holes and all. I thought how I am not at all joyful about hanging metaphorical laundry for all to see. I prefer to take care of that in the privacy of my home, behind closed doors. This is how our modern, self sufficient, independent, outward focused world works, and we expect that even the tough stuff of life can be dealt with on the speed cycle, folded and placed back in our closet without even our closest neighbour catching sight of our stains. The Bible is full of sin-stained people, and it is through them that God reminds us of our human need of cleansing. In Psalm 51, after Nathan has confronted David over the dirty Bathsheba affair, King David dumps his dirty laundry at the feet of God. David was aware that his dirty laundry was now in view of the kingdom, and of the greatest king. It was the publicity of his sins that brought him to his knees in humility. From that vantage point, his sin stained laundry could be bleached spotless. To read this Psalm is to recognize the therapeutic benefits of hanging ones laundry out on a clothesline, and once dried in the wind and sun, to retrieve what was pinned there, only better and brighter.